Are Intimidator Utility Vehicles Street Legal? | Intimidator Inc. There is no better feeling than riding the trails on a side by side! Do you wish you could take that incredible feeling on the highway? 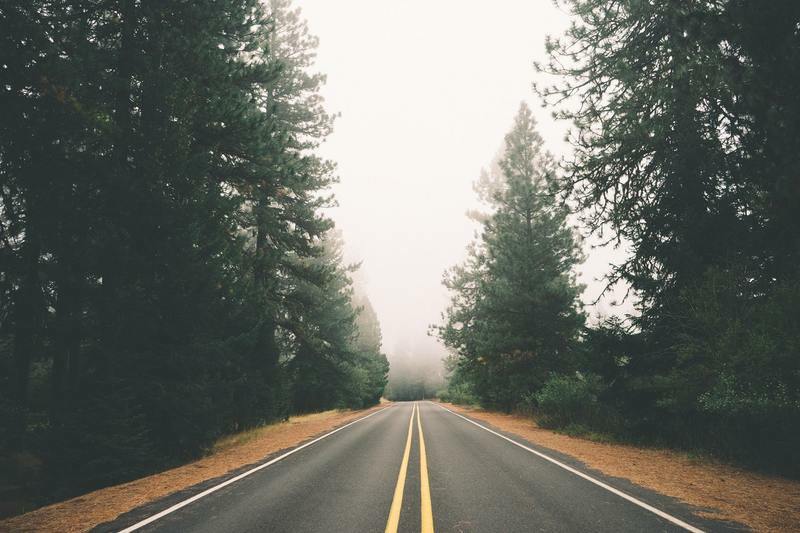 The good news is that side-by-sides can now be easily modified to become street-legal in about HALF of the United States based on requirements set by the state, county, and city of residence. Being able to drive your UTV as an on-highway vehicle makes it easy to hop from trail to trail, navigate the roads during inclement weather conditions, or simple cruise down to the local restaurants in style. Think you’re ready to take your side-by-side UTV to the next level by making it street legal? The process may be easier than you think! The first step in legalizing your side-by-side UTV for street use is understanding your LOCAL laws and how they apply to your vehicle. We have broken this process down into three easy steps to help get you on the road as quickly, and as safely, as possible. Due to the rising popularity of UTVs and side by sides, more and more states are working to pass laws legalizing the on-road use of these vehicles. However, these laws can often have limitations on where and how you can drive your UTV. It’s also important to remember that these laws are unique to each state and may vary by county and even city limits. For this reason, it’s important to understand how these laws apply to not just where you live but where you intend on driving your side-by-side. Unfortunately, there is no universal list of state requirements for the use of side by side UTVs. A good way to start finding information is to call or visit your local DMV to determine if it is even possible to legalize a UTV in your state. The DMV should also be able to provide you with a list of required equipment. From there, take a moment to visit your local courthouse and confirm any additional requirements for your county/city. Once you know the legal limitations of your side-by-side UTV, you can begin successfully modifying your vehicle for street-use. Headlights: Most modern UTVs come stock with headlights, but it’s important to optimize your visibility with high and low beam LED headlights. These come standard on some UTVs, including all Intimidator UTV models. Tail/Brake Lights: For most UTVs, this is one set of lights located on the back of the vehicles. The tail lights come on and stay lit when the vehicle is running. The brake lights are typically brighter in color and signal that the vehicle is coming to a stop. These also come standard on all Intimidator UTVs. Seat Belts: When operating any vehicle on the highway, it’s important to wear your seatbelt. In order to make your SXS street legal, these will likely need to be DOT approved restraints. Many modern UTVs, including those made by Intimidator, will already have this feature. Intimidator UTVs have 3-point DOT Approved Restraint Belts. Turn Signals: Adding turn signals to your UTV is a relatively simple affair, and riders can find multiple plug-n-play assemblies online. DOT Approved Tires: Most side by side UTVs come equipped with off-road tires for maximum traction. However, when taking your side-by-side on the streets, it’s important to utilize the proper, DOT-approved tires. To check if your tires are DOT approved, simply look for the code molded into the side wall. This should be a combination of letters and numbers that start with the DOT abbreviation. Windshield: The windshield requirement, while relatively common, is one of the most varied. Some states will allow you to legally drive your utility vehicle without a windshield as long as you are wearing proper eye protection, such as the Bad Dawg UTV/ATV/Dirt Bike Goggles. Other states require partial or full plastic coverage, while states like Michigan require a full glass windshield. There are a number of options available based on both legal requirement and rider comfort. Intimidator even offers a Tilting Glass Front Window with Optional Wiper to maximize all-weather visibility and air flow. Rear View and Side Mirrors: This modification is perhaps one of the easiest to complete. For a cost-effective option, consider adding a couple of the 1.75” Universal Mirrors for both the side and rear view. 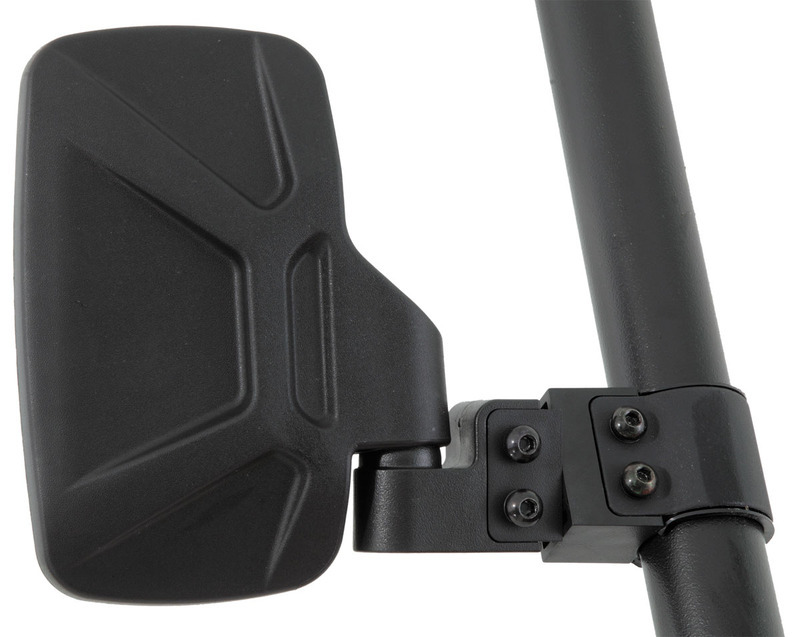 If you are looking to increase your maneuverability without sacrificing visibility, you may consider upgrading to a 1.75” Breakaway Mirror for the side of your UTV. Horn: Many turn signal kits will also include a horn, but they can also be bought separately if preferred. If you do need to purchase a horn, remember to verify your states sound level requirements. Reflectors: In addition to headlights and tail/brake lights, many states require you to have reflectors attached to the back of your UTV. This allows other drivers to better see your vehicle from the road and is especially important for non-traditional highway vehicles like a SXS/UTV. Many stick-on reflectors can be found online or you may even be able to use a couple strips of reflective tape to meet this requirement. Just be certain to look for any certain color or location requirements that may be enforced in your area. License Plate Mount and Light: If you get your UTV registered for street use, you will need a way to secure a license plate to your utility vehicle. Look for a place to mount your license frame, possibly on the back tab present in many roll cage designs. Then, add a white light to illuminate the area, such as a small LED strip. This list isn’t completely inclusive, and you will need to discuss the extent of modifications required by the state with your DMV to ensure all legal requirements are met. 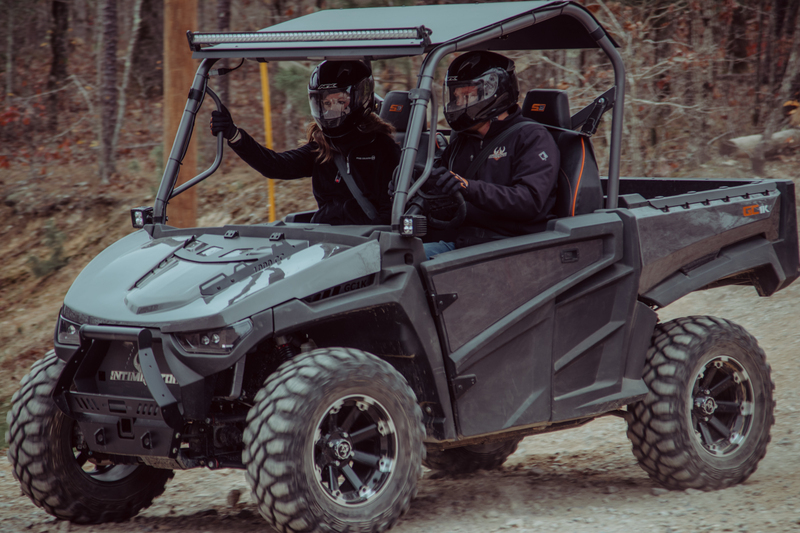 However, these additions can go a long way toward making your UTV a safer ride and should be considered for anyone looking to improve their UTVs overall driveability. Legalizing your UTV for street use goes beyond adding equipment to your vehicle. You will also need to ensure you, as the owner/driver of the UTV, meet certain requirements as well. This information also varies by location. However, requirements commonly include registering your vehicle, obtaining proper insurance coverage, owning a valid Driver’s License (the vehicle class required may also depend on your state), and having your vehicle inspected for safety and environmental impact. Remember to pay close attention to specifications of equipment parts and to carefully note which areas you can and cannot drive your UTV through. Intimidator UTVs come standard with many of the safety features required for making your UTV street legal, including high and low beam LED lights, tail/brake lights, and DOT approved restraints. Once you have acquired a list of legal requirements for your area, your local Intimidator UTV dealer may also be able to help you in selecting add-on accessories. You can find your local dealer by clicking DEALER LOCATOR. Searching for accessories to modify or make your UTV street legal? You can shop for accessories on the Intimidator website or at our partner company Bad Dawg Accessories.